Apple Valley Pastor Isabella Simpson from Spirit Life Church will host a live stream to a national event growing in popularity by pro-life activists called the Day of Mourning. The event was set in motion by Elizabeth Johnston, known as the “Activist Mommy” after the New York state Legislature passed a bill making it legal for abortionists and other health care professionals to perform abortions up to birth for any reason that might threaten a woman’s mental or physical health. 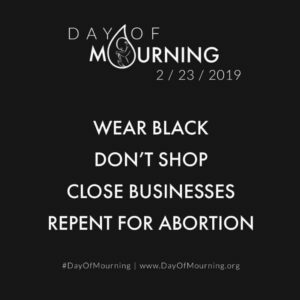 Johnston is calling on Americans to take a stand on Saturday, February 23 and to “stop being on the sidelines and mourn and repent as a nation over the sin of abortion.” She also urged people to wear black, shut down their businesses and avoid shopping. The Reproductive Health Act was passed with a 38-28 vote and thunderous applause in the state Senate chamber on Jan. 22. The bill codifies federal abortion rights guaranteed under the 1973 Roe v. Wade Supreme Court decision and removes abortion from the state’s criminal code. The Feb. 23 rally in New York is planned for 1 p.m. at the Empire State Convention Center, located in Albany. Scheduled speakers include “Mommy Activist,” Elizabeth Johnston, the Benham brothers, pro-life activists Justin Reeder and David Harris Jr., and abortion survivor Blythe Mullen. Day of Mourning Events are scheduled across the U.S. and will include live stream video to the event in New York. Additional events may feature worship, prayer, testimonies, and guest speakers. The Apple Valley Day of Mourning will take place Saturday, February 23 from 8:30 a.m.—12:30 p.m. at the ARC 13631 Navajo Rd. Anne Chernabaeff from Menifee read about the Day of Mourning event in Apple Valley on Facebook and plans put her online baby apparel store, Tater Tot Threads on hold to attend, along with her husband, Eliah and their thirteen-year-old daughter, Moriah. Gregg Kennen from Los Angeles although unable to attend the closest event in Apple Valley will be marching with Calvary Chapel of San Pedro to City Hall Plaza wearing black to mourn and pray. A former pastor, Kennen will be “part of the leadership involved under the covering of my Regional Pastor Jeff Johnson in Downey and local Pastor Jerry Cesario in San Pedro. “All Calvary Chapels are in support of The Day of Mourning including Pastor Jack Hibbs from Calvary Chapel of Chino Hills who was called by the senator to travel to Washington,” said Kennen. New York Gov. Andrew Cuomo celebrated the signing of the new law allowing abortions until birth in some cases and letting non-doctors commit abortions by directing that the One World Trade Center’s spire be lit pink overnight on January 23 inciting pro-lifers across social media. “What they have forgotten is the plaque nearby that also commemorates the death of the unborn children who died in the 911 incident,” said Kennen.